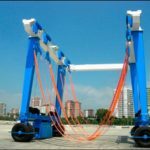 Ship Travel Lift For Sale Has Portable Weight Factory Price Professional Travel Lift Manufacturer Best Choice! 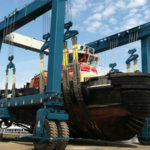 Ship travel lift for sale is necessary equipment for lifting boat. It has many types to choose. For loading capacity, it can be divided into heavy duty travel lift and light duty travel lift. 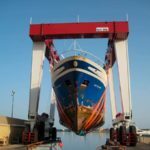 For occasion, ship travel hoist includes shipyard travel lift, yacht travel lift, wharf travel lift, travel lift for water sport meetings, travel lift for aquatic clubs, travel lift for voyages. Ellsen Group, a professional travel lift manufacturer in China, provides reliable marine travel lifts for sale. Ellsen travel lifts have many advantages, such as long service life, durable material, terse structure, easy operation, fast maintenance, good price. Ellsen travel lifts can increase efficiency, save energy and improve condition. According to conditions and practical needs, customers can choose suitable type from Ellsen! Top quality, factory price, high safety! Buy Ellsen travel lifts for more benefits! 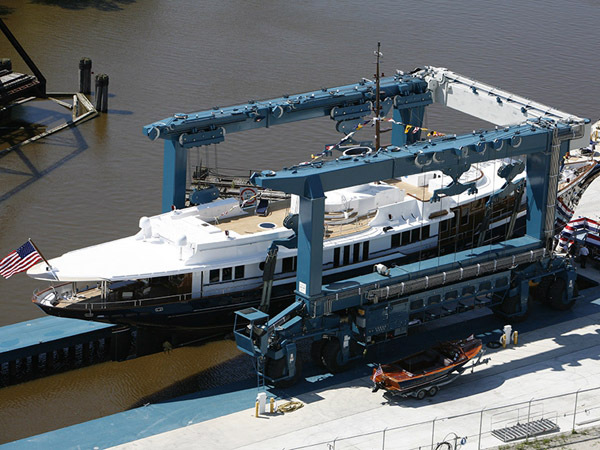 Marine ship travel lift is a kind of dedicated hoisting machinery. 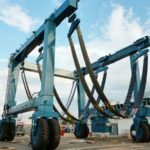 It is used for lifting boat from water or unloading boat into water, it is also applied for land transportation. 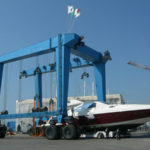 Marine travel lift is mainly used for coastal ports. Crane travelling mechanism adopts tyre running mechanism, it can achieve 360 degree turn. 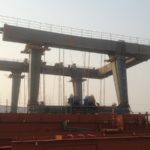 Whole crane is controlled by hydraulic and electrical equipment. With compact structure, it is safe and reliable. 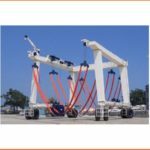 According to customers’ different requirements, the mobile ship hoist can handle different tons from 10 ton to 1200 ton. 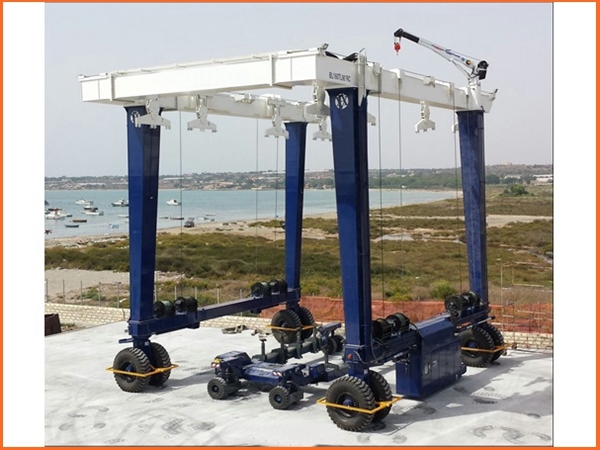 This kind of vessel hoist is amphibious. It can be used for maintenance work on the shore side or can put new boat under water. It adopts soft and firm belt to lift the boat, yacht, it will never hurt the surface. The crane can save the storage space, because it can put the boat in sequence quickly with small gap between each two boat.